Very tasty salad. The quail eggs can be a pain to peal but the yolks were lovely and soft and everyone loved them. p. 127 Sept 2010 - First use of this recipe. Selected b/c I had mushrooms and leeks to use up. Came together quickly and resulting flavours were great. I'd definitely make this again for its ease and impressive results. Added some bacon as I didn't have enough pancetta. Made freestyle - used No Flaming Raisins muesli, butter and demerara sugar. Blitzed in machine and added more muesli at the end to make sure there was some crunch. All munched up! Throw away the takeaway menus, ready meals and convenience foods! These days everyone wants fast food but at the same time they want to eat well. And there's no one better than Gordon Ramsay to show you how to cook real food fast and make it taste delicious too! With his unique style, high voltage energy and passion for good food, Gordon shows how to get a great meal on the table in less time than it would take to have a takeaway delivered. Taking his theme from the new series of C4's "The F Word", his new bestseller is packed with ideas for 5-minute snacks, 10-minute main courses and 30-minute menus for all occasions. 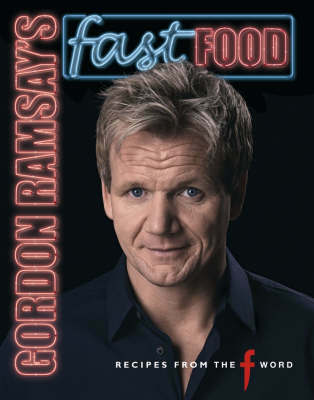 A cookbook for the way we live today, "Gordon Ramsay Fast Food" is the stunning follow-up to his fabulously successful "Sunday Lunch".